Throughout mandatory detention’s sorry history, protests inside detention have been central to forcing the issue into the media and winning changes for the asylum seekers themselves. Darwin’s detention centres will be the focus of the refugee movement’s Easter Convergence this year. Hopefully it will push the issue of detention back into mainstream political attention. But some people, including refugee supporters, question the value of protests, particularly at detention centres. They argue that they can even harm asylum seekers, left vulnerable to guards and psychological trauma after protesters leave. 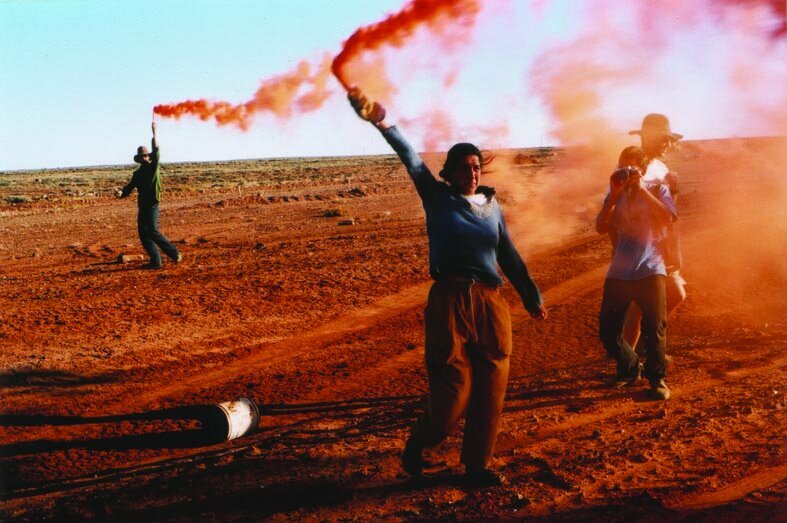 In June 2000 around 400 asylum seekers pushed down the fence at Woomera detention centre and marched into the town. Woomera had only been open for seven months. Asylum seekers in Curtin and Port Hedland then took similar action. The desperate protest pushed the issue onto the TV news and the newspaper front pages. Government efforts to keep detention centres “out of sight, out of mind” were blown out of the water. Asylum seekers have not been out of the news since. But something else happened. Most of the protesters had been in detention since Woomera opened, and asking for weeks what was happening to their refugee claims. There had been no answers and no visas—but within a few weeks of their protest, the visas arrived and people started to get released. At the time, Woomera had only one phone and you needed a phone card to use it. Eventually, after further protests, representatives of different groups were given phones. As a result, their isolation began to be broken down. Over the next few years, tens of thousands of people took part in marches and demonstrations. When the first Easter convergence took place at Woomera in 2002, asylum seekers knew the protest was planned and began planning their own. It resulted in a mass break out and escape of 13 asylum seekers. By 2005 the movement had forced changes despite the worst efforts of the Howard government. By April 2003, Woomera was closed. In July 2005, children and families were released from detention. And that same month, Peter Qasim, who had been in detention for seven years, was released on a “removal pending” visa—introduced by then Minister Amanda Vanstone to release the last of the long-term detainees. Jump forward to December 2007 and Labor’s election. Rudd ended the Liberals’ temporary protection visas and closed Nauru. But in every other respect he went down the same path as Howard, opening Christmas Island, and re-opening Howard’s worst of the worst detention centre, Curtin, in April 2010. In September 2010, in scenes reminiscent of Woomera in 2000, Hazara asylum seekers, worn down by the freeze on processing Afghan asylum claims and fearful of deportation, broke out of detention in Darwin. Again the protest pushed the plight of refugees onto the front pages and also began an awakening about the situation under a Labor government. In October 2010, Immigration Minister Bowen finally admitted there were hundreds of children in detention after persistent denials and said they would be released. But we’re still waiting. In March 2011, a so-called riot broke out on Christmas Island, blamed on failed asylum seekers. It was actually a protest by hundreds of asylum seekers who had been waiting months for answers. In response, the government promised them answers by April. After a mass hunger strike at Scherger in July 2011 over the bias of reviewers against Hazaras, the Immigration Department quietly established a review of all the Hazaras’ cases, resulting in scores of rejected asylum seekers being granted visas. Similarly, hunger strikes in Darwin delivered second appeal reviews, again with many positive results. The lesson learned was not a “problem”—it is part of the ABC of political change. And what was true in 2000 is just as true in 2012. It is protest that has won improvements when negotiations and “going through the right channels” has yielded nothing. Even after 20 years, it’s the power of protest that can finally end mandatory detention.